The Domaine Dupont is located in Normandy, France. The orchards of the Louis Dupont Family estate cover 30 hectares (74 acres) right at the heart of the Pays d’Auge region, 6000 apple trees in 13 different varieties. The soils of the Pays d’Auge region, are marl and chalky marl and limit the growth of the trees leading to the production of smaller apples. The aromatic intensity is thereby increased and the ratio of skin to pulp helps to favour the extraction of tannins. Nitrogenous fertilisers (which swell the fruit by water retention) are not used – giving priority to quality rather than yield. At the end of the pressing process the must has already acquired the attractive golden amber tints of cider. After several weeks of fermentation in vats, the cider is racked and bottled. Fermentation will subsequently continue slowly in the bottle, and the carbon dioxide that is naturally produced is retained by the cork to create the natural effervescence of cider. The faint haze and the deposit present are the proofs of this bottle fermentation. They give the ciders from the Domaine Dupont their unique aromatic complexity. Stocked upright in good conditions (less than 15°C (59°F) the cider will improve and its mousse will become finer and more persistent. Cidre Dupont Reserve is aged six months in oak casks which were used tohold Calvados. This ageing gives subtlety and excellent complexity. The cider is a blend of 67% of bittersweet apples and 33% of acidic apples. After a natural yeast fermentation in temperature controlled stainless steel vats, the cider is transferred to 400-litre used Calvados barrels, where it gains complexity and mellows for six months. The cider is bottled unpasteurised. 7.5 % ABV. It is very gently sparkling with a fine mousse. The colour is pale yellow, faintly hazy. 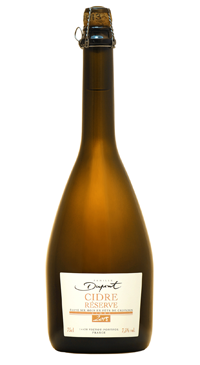 Light aromas of stewed apples and pears, mild spices. The palate offers complexity with notes of pineapple, lemon and calvados.